Being around young people who are passionate about theatre, and who want to engage in in-depth discussion with each other and with working theatre professionals makes me excited about the future of theatre in this country. Because of this, one of the best parts of my job is facilitating monthly meetings with the MTC Ambassadors: a group of 25 Victorian Year-11 students who participate in a year-long program that aims to extend their knowledge and experience of theatre. Throughout the year, our Ambassadors see ten MTC productions, meet with various MTC staff and creatives each month, and form friendships with like-minded students from all over the state. As we start preparing for our 2012 Ambassador Program, I invited one of our 2011 Ambassadors, Phoebe Tapley, to share her experience. The tag line for the MTC ambassadors program for 2011 was ‘A voyage into the world of MTC’. Upon reflection, this statement perfectly summarises my experience of the program. On a surface level we were given the chance to delve into the inner-workings of MTC. However, through this experience we were also encouraged to ‘voyage’ into the world of theatre in general; to explore our own perceptions of and interest in theatre. One aspect which I was able to explore was the role of theatre as a means of communication and expression. Seeing performances like Next To Normal confirmed my thoughts on this idea by demonstrating the theatrical capacity to explore complex and potentially taboo subject matter like mental illness. It inspires wonder and awe at what can and has been achieved through theatre. Conversely, for me this program has also emphasised the more obvious role of theatre: to entertain. We were presented with various styles of entertainment from the fast wit of Australia! The Show! _ to the brilliance of _Hamlet. It was refreshing to be given the opportunity to watch a performance simply for the pleasure of watching a performance. As drama students we are often used to watching plays whilst preoccupied by the analysis assessment which will soon follow. Hence the opportunity to enjoy the nuances of a play without the constant inner analysis of dramatic elements and expressive skills was very much appreciated and I think helped to kindle my passion for theatre. Suzie gave us the opportunity to meet with a diverse group of theatre professionals, including directors, actors, playwrights, set designers, theatre critics and even a casting director. Each speaker gave us an insight into their respective worlds and responded generously and readily to our questions. Their views and experiences of theatre in general were always compelling and the stories of each speaker’s pathway to their current position were listened to with equal enthusiasm, as for many of the ambassadors this was a chance to delve into career aspirations. 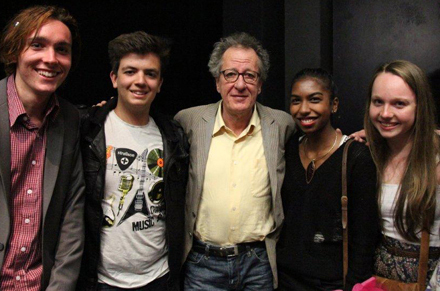 Our year ended with a much anticipated chat with Geoffrey Rush, after having seen him in action in The Importance of Being Earnest. The program has also most certainly developed my critical eye for theatre. This was facilitated by the experience of not only watching a range of performances, but then of analysing the performances through discussion with the other ambassadors. Guided by Suzie’s questions and comments during our discussion, I also now feel more capable of identifying the specific elements within a production which make it work or perhaps not work – something which I know will prove to be invaluable during my studies of Year 12 Drama this year. The MTC ambassador program has been a truly incredible ‘voyage’ into the Melbourne Theatre Company and, by extension, into theatre in its entirety. It developed friendships between fellow theatre-lovers, affirmed and further developed their passion for theatre, instilled a greater understanding of what it encompasses and incited excitement and hope for what is to come. Thank you to Suzie and MTC for this incredible opportunity!